Game of Thrones has never been very good at depicting time. In fact, I'm not even convinced it's ever concerned itself with doing so. In the early seasons of the show this wasn't an issue - there was no big imminent threat, no incessant talk about running out of time. Season 7, thus far, has seen the show bounce its characters around the Westeros map like a pinball machine, and I, like most, have been easily forgiving of it. At this stage in the game, we don't want to sit and watch characters on boats simply making the journey from one place to another, and by cutting this out the show enables itself to feel more streamlined. However, "Eastwatch" threatens to take this notion too far. Characters venture back and forth to cities days away, people make sudden returns to places without the episode giving us any sense of how long it took them to get there. Jon keeps rambling on about this enormous and immediate threat North of the Wall, but the show willingly skips over a good week or so to take him up to Eastwatch. Well...what's going on during this week? Is Dany advancing her battle against Cersei? Is Cersei rethinking her strategy against Dany? Where does Sam fit in with all of this, at what stage in the timeline is he right now? It's a tough criticism to make, as I'm not sure I could serve up an easy solution to it - but that isn't my job here. "Eastwatch" throws its characters around the map so frequently that it borders on laughable by the end. And speaking of the episode's end, was it really worth all these subplots and character returns just to send Jon beyond the Wall with six of the dullest, most forgettable and expendable characters that Game of Thrones has ever written? I can't really answer that until next week, but right now it feels anticlimactic and awkward. A handful of different characters coming together should feel like progression, but here it feels like engineering work. There's also a sense that "Eastwatch" struggles to really allow the individual characters to shine in amongst its heavy plot mechanics. 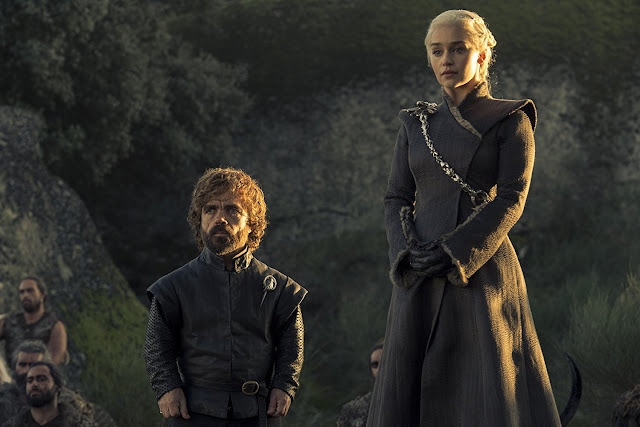 Dany has become a more interesting character this season than she's been in years, but here she's reduced to a simple "Join me, or die" speech, complete with a worried look from Tyrion. Y'know, as if the show doesn't trust us to understand that Dany is showing similar signs to the Mad King, it has to make sure it cuts to a reaction shot so that we definitely know. The long conversation between Dany and her many friends and advisers also falls flat, with every individual in the room popping up to deliver a piece of information each. Again, rather than feel like a natural plot progression or a real conversation between real people, it feels engineered. A lot of moments in "Eastwatch" are suitable enough to get the job done, but aren't exactly smooth about it. Matt Shakman's direction is impressive again, but the episode's script seems to fall behind him. Cersei's dramatic revealing to Jaime that she knew of his secret meeting with Tyrion didn't really land, the scene only saved by Lena Headey's reliably strong performance as Cersei reveals her pregnancy to Jaime. The last few episodes this season saw Game of Thrones return to a terrific reliance on interesting dialogue pieces, but "Eastwatch" seems to forget this in favour of moving the plot forward. Again, it gets the job done, but isn't exactly smooth about it. Much to my surprise, though, "Eastwatch" actually does work to correct one of my biggest issues with Season 7 - the handling of the Stark reunion. This episode finds a conflict between Sansa and Arya, as Arya questions Sansa over her intentions in the long game and Sansa fails to really understand her little sister's new mentality. Staging the scene inside Ned and Catelyn's old bedroom is a genius move too, adding to the sense of an emptiness inside a home that I've wanted the show to explore with the Stark children this year. It's a terrific scene, and one that should remain interesting as we move forward. In fact, it's almost good enough for me to forgive the poorly executed moments of Arya spying on Littlefinger and then Littlefinger spying on Arya. Emphasis on "almost". This isn't necessarily a bad hour of TV, but it's one that makes a pretty big sacrifice in favour of (hopefully) making the two episodes still to come as good as they can possibly be. 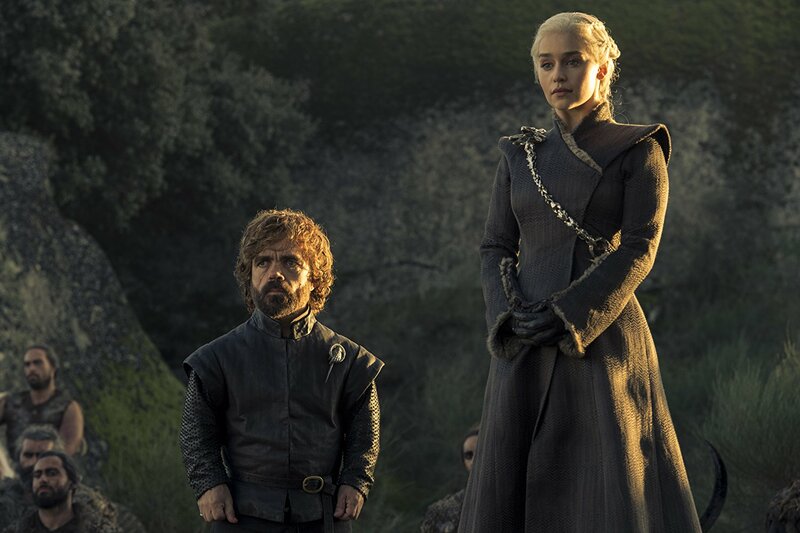 After the unfocused and cluttered season premiere, Game of Thrones launched into three consecutive stellar episodes - let's hope "Eastwatch" can leave a similar legacy. So one of the biggest Game of Thrones theories was confirmed this week - something that will change the show forever and alter a great deal for a huge number of characters - and it was revealed by Gilly. That is so brilliant that I don't even know where to begin with it. This scene also featured Sam's rant about High Septon Maynard's 15,782 shits. It was a great scene. Is Cersei really pregnant? Or is it a ploy to keep Jaime by her side? If she loses him then she'll have lost everyone. That shot of all the ravens on the tree, their eyes warging one after the other? Yeah that was pretty stunning. The Night King remains terrifying. We still don't know the title for episode six yet, which is both brilliantly exciting and annoying. Come on guys, you can give us episode titles, right? No? In addition, though, is always that you’re going to be capable of playing legitimate Jetbull website video games everywhere you find yourself on the planet, at any time in time niter and day. The jetbull online casino which Jetbull web site offers is accessible all main computers as well as cellular devices, we’re sure the first is within the pipeline!! What an excellent expertise! buyer services was excellent when neglected shipping and delivery because of simply being in another country she sent it especially in my day of return I can’t advise ample brilliant service that is difficult to find these working day many thanks folks.